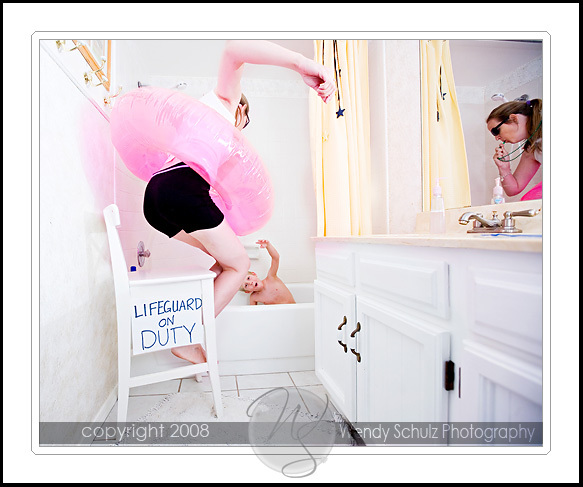 Self-Portrait Tuesday: Lifeguard on Duty, SIR! This is my ALL TIME SUPER MOSTEST FAVORITEST SNL SKIT EVER! EVER!!!1!11!!!! I laugh at it every time. This entry was posted on July 1, 2008 at 6:18 pm	and is filed under Self-Portrait Tuesday. You can follow any responses to this entry through the RSS 2.0 feed. Both comments and pings are currently closed. i have no idea what the SNL skit is since i don’t watch it. but this photo is hilarious! such a great shot! ROTFLMBO…this is by far the BEST self portrait ever! How many times did it take you to get it this perfect? LOVE the video – hadn’t seen that one yet. The picture is awesome as always! you crack me up! seriously! This is HILARIOUS!!!! By far the best yet! love it! especially your kids face! now that cracks me up! Way too funny!! love SNL but have not seen that one. Carey is too rich!!! !